90% of executives fail to meet their goals. That’s the startling conclusion of research from the Economist Intelligence Unit (sponsored by the Brightline Initiative). Strategic alignment is the no-so-secret weapon that the top 10% use to make sure they do hit their goals. In any industry or market, some companies do better than others. Strategic alignment is one of the key differences between organizations that perform well and those that don’t. In fact, research shows that up to 80% of the differences between organizations’ performance can be explained by their level of strategic alignment. Strategic alignment is, therefore, critical to any executive, to any organization that wants to achieve its goals and to outperform their competitors. On this page, we will set out our Ultimate Guide to Strategic Alignment - enjoy! First, what qualifies us to talk about strategic alignment? TransparentChoice helps companies, government agencies and non-profits around the world improve their business results by building direct links between their strategic goals and the actions they take. This means we have seen the good, the bad and the ugly of strategic alignment… and it can get really ugly! Sometimes this work is at board level, defining overall strategy and getting everyone on the same page. Other times it’s about strategic planning and resource allocation for key projects and initiatives. And sometimes it’s about an apparently simple decision such as buying some software or selecting the site for a new warehouse, but in all cases, increasing strategic alignment leads to better results. Because strategic alignment is so important, we are going to go beyond the high-level descriptions that you often find on the Internet and really look at what strategic alignment is, why it’s important and what you can do to improve it. We will look at some special cases where strategic alignment can be quickly improved to deliver meaningful and immediate value to your organization. We’ll also point you at resources where you can learn more. This guide will be useful both to C-suite executives and to line-managers who are simply trying to “do better”. Why does strategic alignment matter? What are our strategic goals? Understanding strategic alignment starts with understanding what strategy really is. Most people think of “vision statements” and “mission statements” as being “strategy” but they are only a small part of the “strategy story”. Your mission and vision are simply statements about what your organization is for and where the executives would like to take it. Strategy - in the context of “strategic alignment” - is the “how”. For example, our vision/mission might say something like: We want to be the most profitable widget manufacturer in the world? In the real world, you’d probably want to put some specific numbers on these goals, but this “big picture” of what we’re trying to achieve (be the most profitable widget company) combined with a high-level statement of how we’re going to achieve it (by being low cost, increasing distribution while managing cash) is your “strategy”. Having a strategy is not enough. In fact, research suggests that having a strategy has no real effect on the performance of your business. It’s aligning your activities to your strategies that makes the difference. Now that’s a pretty big statement, but actually it’s also pretty obvious if you think about it. Look at it this way; deciding you want a cup of coffee (your strategy) is not the same as getting up and making a cup of coffee (aligning your actions to your strategy). STRATEGIC ALIGNMENT (verb): The process of aligning an organization’s decisions and actions such that they support the achievement of strategic goals. Note that the definition talks about decision-making and actions. Actions typically follow decisions so if your organization doesn’t have the ability to make well-aligned decisions, they really can’t take well-aligned actions. Note also that, implicit in the definition, is the fact that strategic alignment involves NOT DOING some of the things that you might currently be doing… things that do not support the realization of strategic goals. One study found that the level of strategic alignment of an organization explains up to 80% of the difference in performance between organizations. This is a quite startling result. Another study found that 51% of the difference in organizations’ performance can be explained by strategic alignment and another 38% can be explained by the level of consensus / buy-in. So alignment is important, but so is buy-in and support - together they explained around 90% of the variation in operational results of organizations. A third study shows that 18% of the difference between the overall performance of organizations is explained by the level of strategic alignment between their business goals and the activities undertaken by the IT department. So, aligning your IT investments to support your strategy really is important. We could go on - there are many studies into the impact of strategic alignment - but I think the message is clear. Strategic alignment matters because it is very strongly linked to improved business results. You just need to put your strategic goals at the heart of everything you do. But of course, that’s not quite as simple as it sounds. In an ideal world, your strategic goals will flow from your strategic planning process, but in most large organizations, strategic planning is not really done properly leaving most managers wondering how “big strategic statements” affect them. There are some things you can do to identify your own strategic goals even if the overall strategic planning process isn’t giving you what you need. There are two steps; first you need to identify your strategic goals, then you need to assess the relative importance of your goals. This second step is really important (and is often left out) because it’s the weights / relative importance of your goals that helps your team make clear, consistent and well-aligned decisions. So, let’s look at these two steps in more detail. Before we look at how to identify goals, let’s talk about what they are NOT. Strategic goals are not specific projects or initiatives. When we ask managers what their goals are, we often hear answers like, “I need to deliver Project X” or “I need to launch Product Y”. These are deliverables or actions that exist to help you achieve your goals. Looking at the key projects your team is working on is often a good place to start identifying the actual goals. By looking at the “goals of the projects,” you often find the goals of the organization. Let me put that another way. If Project X will help you enter the European market, for example, then “Growing sales by entering the European market” might be one of your goals. Delivering Project X is simply one of the things you’re doing to help achieve that goal. So take a look at your major projects and ask, “What are the business goals of this project?” - this will give you a good initial list of strategic goals. Next, if your organization has a set of key performance indicators, they can help you figure out what the overall goals are. There are limitations here, though, as KPIs can become “set in stone” in many organizations. This means that your KPIs may reflect your goals from several years ago! One airline I spoke to had a set of KPIs that they used to drive resource allocations. When asked what one of those KPIs actually meant, nobody could answer - noone even knew what this KPI actually meant - it had simply been there for years and was “how we’ve always done it”! So, KPIs can be a good starting point, but double check that they really reflect your current goals. Now you have a list of your strategic goals, it’s time to work out the relative importance of your goals. Why? Well, simply put, not all of your goals are equal. More importantly, your key stakeholders are unlikely to agree what the relatively importance of your goal. This means that there’s no common “set of rules” that can guide decision-making and actions making it difficult to keep things aligned. So, we need to “weight” our goals but we need to do it in a way that everyone supports. While this sounds like a simple task, it turns out that there are good ways and bad ways to do it. Simply grabbing a whiteboard and asking a room full of people to weight / rank your goals is typically not very effective, for example. That kind of process is open to decision biases creeping in and tends to be poor at building real consensus and buy-in (though you may think you reached consensus). Research into decision making (specifically into multi-criteria decision making which is what we’re dealing with here) shows that a process called AHP (analytic hierarchy process - don’t worry about the scary name) is best. Now you have a weighted map of your top level goals that clearly shows what’s most important, you can share them with your team. The wider you share them, the more thoroughly your team understands what you’re trying to achieve and why, the more likely they are to use your goals to help drive their own decisions and actions. This topic deserves its own page, but I will summarize it here. Strategic planning is the process of defining strategy and then cascading it down through the organization and turning it into a tactical plan. Strategic planning happens at all levels in the organization. Done well, strategic planning builds strategic alignment into everything you do. Core corporate goals and drivers are taken up by the divisions of your organization. Each division then comes up with their own strategy and the associated goals. These goals then get taken up by the next level down (let’s call them departments) and get converted into their own set of strategic goals… and so on down the chain of command. At each level, managers should be selecting initiatives and investments that support their goals - in other words, the goals become criteria for selecting the right things in which to invest time and resources. This is often a great opportunity for some bottom-up planning as people lower in the organization are often the ones who “know how things work”. For this to work, however, the leaders of a group need to be able to clearly articulate the goals and this is one of the common ways an organization can fail to align its activities to its strategy. We will return to this topic when we look at the barriers to strategic alignment. NOTE: Organizations often get confused about the difference between budgeting (financial planning) and strategic planning. If an organization focuses on its financial plan without first creating a strategic plan, they tend to become fossils. By that I mean, their planning tends to become a process of “Here’s what we did last year. Let’s increase sales by 5%, decrease costs by 4% and call it a plan.” Organizations that plan this way tend to perform less well. This isn’t just some vague idea that strategic planning is better than financial planning (it’s not - they are fulfilling different roles). It’s a statement that, if you miss out the strategic planning step (which, remember, should come before financial planning), your business performance will suffer. In fact, research by McKinsey shows that organizations that practice effective strategic planning are worth 40% more than those that don’t. Forty percent! Okay, let’s say we want to improve our strategic alignment. How do we go about doing it? Well, what we’ve learned so far is that strategic alignment is about making decisions and taking actions that align to your strategic goals. “Goals” is plural. There are usually several of them. So measuring strategic alignment is not simply a check box task. Asking a simple yes/no question, “Does X align with strategy?” is one of the most common mistakes people make when trying to achieve strategic alignment. Why? Well, because everyone will say “yes”. Really what we’re interested in is the contribution X makes to your various strategic goals. In other words, whenever you’re making an important decision you should be evaluating the contribution each alternative (projects, vendors, sites for a factory, etc.) makes to your strategic goals. Only then will you be able to work out which alternative is best aligned to those strategic goals. Another common mistake people make when measuring strategic alignment is to assume that the executive team should do the measurement. For example, when selecting projects for the coming year, many organizations will wheel those projects out in front of the senior management and let the leadership team make their own determination of strategic alignment. The VP of sales can make a good determination of how a particular project will affect customer care? Your CFO is a good judge of how much more revenue will be generated from a particular initiative? Of course not! So how do we, in practice, measure alignment? The answer is to leverage a solid weighted scoring system based on AHP [again, links] We’ve talked about AHP earlier in the document, so I won’t repeat it here. Rather, we’ll look at the scoring part of the process. What difference will this project make to our ability to enter the European market? Now, it’s really hard to write a good scale “in theory” so this scale probably has flaws, but you get the idea - you’re looking to capture what the impact is on the business goal. So now we have a beautiful scale that perfectly captures the contribution to our goals… but who should answer the question? This depends on what you’re evaluating. Generally, the answer should be “people who are experts and who do not have a preference for one outcome or another”. This is why it’s a good idea to have an “independent expert” do the scoring where possible. If that’s not possible, you can always have an expert review answers for reasonableness. This helps you collect more consistent and unbiased data. Sometimes you’re measuring something that is quite subjective or something that you can only estimate by intuition (as opposed to “level of effort” or “net present value” which you can model or based an estimate on previous data). For example, you might be asking “What is the contribution of this vendor’s design to worker morale?” That’s a hard thing to estimate in any really “rational and reliable” way. In this case, pulling in a panel of people and asking them all the same question will give you a much better answer. Research shows that a group of people, even if it’s just 3 people, is much better at making estimates than an individual. So, the rule of thumb is to use subject matter experts to score the contribution of your alternatives (projects, vendors, site for a warehouse, etc.) against your weighted strategic goals. If you’re measuring something that is inherently subjective, ask a group of people their opinion. Now you’ve scored your alternatives, simply multiply together the score and weight for each goal to calculate an overall score for each alternative. The result is an overall score for each alternative allowing you to see which projects (or vendors or locations, etc.) are most aligned to your strategy. It’s often a good idea to present this information in a format something like this with the weighting of each goal and the contribution to each goal for each alternative clearly visible. So, measuring strategic alignment is not so difficult, but it adds huge value and is absolutely worth the effort. Selecting projects and initiatives is one area in which strategic alignment can be easily and quickly improved and where that work has a massive impact on the performance of your organization. Selecting projects is often done by an executive committee and, because of this level of visibility, people tend to assume that the resulting project portfolio is aligned to strategy. Research indicates that this is not the case. According to research by the PMI, 20% of projects in your portfolio contribute so little to strategic goals that they should be stopped. Researchers looked at over 100 methods used by leadership teams around the world and concluded that only two methods are suitable for picking projects. They are called AHP (which we covered earlier in this document) and DEA. You can learn more about project prioritization here. Put another way, if you are not using AHP (or DEA) in your project selection process, you are using a failure-prone method for selecting projects. You are likely to have a significant number of non-aligned projects in your portfolio. This matters because 50% of projects are under-resourced. When your teams are stretched thin, they task-hop which is very inefficient. They also make mistakes and fixing those mistakes draws even more resources from other projects. This, ultimately, results in project failure, overruns, etc. By focusing resources on the most strategically important projects, you deliver value with lower risk. In fact, projects that are aligned with strategy are 57% more likely to achieve their business goals. 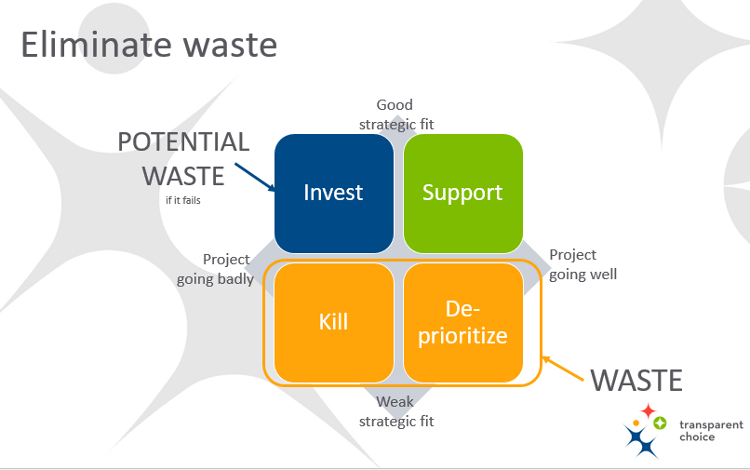 Put it another way, by measuring the strategic alignment of your projects and killing off the projects that are not aligned (labelled as “Waste” in the following diagram) you can reallocate those resources to important projects that are struggling (blue) and turn them into successful projects (green). Fixing the project prioritization and selection process is, therefore, a quick and high-impact way to improve the overall strategic alignment of your organization. You can learn more from our guide to project prioritization.